The Taoiseach was giving a speech at the unveiling of a Civil War hero’s statue when he was heckled by protestors. 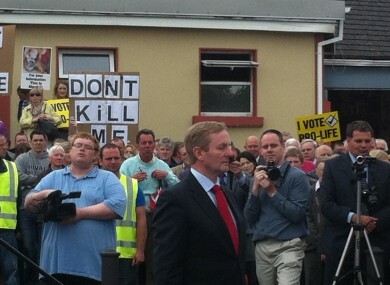 AROUND 200 PRO-LIFE protestors demonstrated at an event in Co Longford yesterday, as Taoiseach Enda Kenny arrived to unveil a statue. The Taoiseach was in Ballinalee, unveiling a statue of General Sean Mac Eoin, a statesman and War of Independence hero, when the demonstrators made their voices heard. He was repeatedly heckled during a 20-minute address to the public, with demonstrators holding banners and placards demanding that the Taoiseach “keep his promise” of refusing to allow abortion in Ireland. Demonstrators said Kenny wanted to “kill the unborn”, in the latest public demonstration of opposition to the Protection of Life During Pregnancy Bill. Kenny laid a wreath at the feet of Mac Eoin, who fought on the Free State side of the Civil War. Mac Eoin later became a TD, winning a by-election in 1932 and remaining a TD serving counties Sligo, Leitrim, Longford and Westmeath until eventually being defeated in 1965. He also fought two presidential elections for Fine Gael, being defeated by Seán T O’Kelly in 1945 and by Éamon de Valera in 1959 – taking 43.7 per cent of the vote against the incumbent 76-year-old Taoiseach. Meanwhile, the Irish Independent this morning reported that Kenny’s family home in Castlebar was also picketed by protestors last night – some of them clad in white shawls and wearing skeleton masks. It said the visit of the 15 protestors was the first time the Kenny family home had been targeted in the campaign. The Taoiseach himself was not present, but that his wife Fionnuala and son Ferdia were present, the Independent added. It has since emerged, however, that the protestors were not part of a pro-life organisation – and were in fact mounting a father’s rights protest to mark Father’s Day. Email “Kenny targeted by 200 pro-life protestors in Longford”. Feedback on “Kenny targeted by 200 pro-life protestors in Longford”.